Zer0reZ and Blackjay like this. Okay so I was against this deal till now.Waste of money, according to a simple minded bloke like me. But after reading this , maybe it's not that bad a deal. At least five passengers were injured in a blast targeting a passenger train in Balochistan's Bolan district on Friday. Levies sources said "miscreants" had targeted the Akbar Bugti Express passenger train in the Hirak area of district Bolan. Bogie Number 9 was partially damaged from the impact of the blast, which rocked the entire area, sources added. The injured were rushed to nearby Mach hospital for medical treatment, where an emergency had been declared. Frontier Corps personnel, levies and police reached the spot as investigations into the incident went underway. The affected train was later brought to the Mach Railway Station. PESHAWAR: Unidentified gunmen abducted Muhammad Nabi Ahmadi, the deputy governor of Afghanistan’s Kunar province, in Dabgari area of Peshawar on Friday. “At first we thought that he was somewhere nearby when he didn’t respond to our calls,” newly appointed Afghan Khyber-Pakhtunkhwa (K-P) Consul General Moeen Mrastyal told The Express Tribune on the phone on Saturday. “We then informed the Kabul government and also the Pakistani high-ups about him,” he added. The consul general said the governor had arrived in Peshawar on Thursday and scheduled an appointment with a doctor in Dabggari the next day. “There, he was abducted by unidentified gunmen and we still haven’t heard anything about him,” he added. Ahmadi’s abduction was confirmed by officers at the Shah Qabool police station. The officers said they were trying to locate the governor and rescue him. Last year, former Afghan governor Sayed Fazlullah Wahidi was rescued in Mardan, two weeks after he was abducted in Islamabad. Islamabad: Pakistan has complained to the US for discriminating between Pakistan and India in the region, officials said. Earlier, secretary of state Rex Tillerson’s demonstrated loving gestures in New Delhi and announced to work together in Afghanistan days after somber meetings in Islamabad where he told the civil and military leadership that the new policy of President Donald Trump on Afghanistan — supporting a greater role for India — will not be changed and Islamabad has to accept this reality. The highly warm meetings in New Delhi after dead-cold interactions in Islamabad jolted the diplomatic corps who are now active to control the damage, senior officials at the foreign ministry said. The officials said Islamabad had launched a diplomatic campaign to counter “US-India nexus” which could prove ‘lethal’ for Pakistan. The officials said that Pakistan was in contact with the US and other influential countries with a one-point agenda to highlight Pakistan’s sacrifices in the war on terror. Mr Tillerson was in Pakistan this week and had a joint meeting with the civil and the military leadership. He made it clear that Trump’s new Afghanistan policy will not be changed on the demand of Pakistan. He emphasized India’s role for Afghanistan peace – a strategy contested by Pakistan. Mr Trump had earlier accused Pakistan of protecting terrorists who were threatening peace in Afghanistan. Meanwhile Foreign Minister Khawaja Mohammed Asif said that US security “failures” in Afghanistan were evident from events of the week when Rex Tillerson could not move out of a US military base and invited Afghan leaders to his “bunker” for talks. “This situation tells the whole story of US failures, despite fighting in the country for 16 years,” Foreign Minister Khawaja Asif told National Assembly’s Standing Committee on Foreign Affairs. He maintained that Pakistan was seeking transparent relations on “equal terms” with the United States and is ready to offer its full cooperation in fighting terrorism, but “without compromising its sovereignty” and scape-goating Islamabad would not be acceptable. Mr Asif further said the decrease in drone attacks in the past few years showed that there were no more safe havens for the terrorists in Pakistan. The minister said since 2013 there had been just 65 drone attacks in Pakistan, and 2010 being the year when the pilotless planes attacked 90 times, the highest in 12 years. In 2013, there were 24 drone strikes; in 2014, 19; in 2015, 14; in 2016, 03 and in the 10 months this year, 05 attacks took place, shows the chart shared by the foreign minister. Pundrick and Bloom 17 like this. With the term of the Pakistan Muslim League-Nawaz (PML-N) government coming to an end, Pakistan is facing a huge economic crisis, which may lead the country to an economic catastrophe. The political leadership— despite being aware of the escalating financial mess— is reluctant to take immediate corrective measures due to the looming general elections. Since corrective measures involve unpopular decision making, the political leadership is reluctant to follow the suite, fearing a public backlash may further push the already out of favour government into a further mess—bad for the general elections. Former finance minister Senator Saleem Mandviwalla claimed net reserves with State Bank of Pakistan have reduced to $12.5 billion, insufficient to cover import bill of three months, while Finance Minister Ishaq Dar is engrossed in personnel cases at National Accountability Bureau (NAB). Talking to Pakistan Today, Mandviwalla claimed that the finance ministry was keeping the nation in dark about the actual state of the economy. He said, “How can the ministry claim having enough reserves when there is already a deficit of $ 12 billion? Nobody from the ministry is ready to answer our queries about the financial situation at the Senate Standing Committee on Finance and Revenue. I know the government has no money to pay if private investors at the commercial banks demand their money back, as the government has spent all the deposits.” Mandviwalla further said the reserves are decreasing by $1 billion every month and it would be standing at $ 11.5 billion in November. Pakistan Tehreek-e-Insaf (PTI) MNA Asad Umar told Pakistan Today, “Every government does the same; they are warned, but they don’t budge. Now bailout is the only option left—IMF”. Expressing his opinion on government’s hesitancy to knock at International Monetary Fund’s (IMF) door, he said this was just political point scoring; sooner or later the government will have to ask IMF for help, but it would be too late then, as the country would have sunk deeper into the financial quagmire. “I have been told that for the time being the government is going to the international bond market to seek more expensive debt,” he said, adding, “The country is sinking deeper into expensive debt as it has never obtained such a huge commercial debt which the PML-N government is doing now”. He said the government has already taken Rs 4.5 billion short-term expensive debt and now it is eyeing Euro Bond and Sakook Market to seek more debts. So, on one hand, the quantum of borrowing is growing; on the other, the expensive average pricing is also increasing. He said the current fiscal policies of the government will leave it with no option but ask the International Financial Institutions (IFIs) for a bailout. According to him, this year Pakistan’s financing gap would be $ 18 billion. Now picking $ 18 billion from the commercial market is almost impossible. Terming government’s policies as delaying the inevitable, he said even if the government obtains debt in this year, it can’t go for another borrowing next year, which means it will have to seek help from IMF. The only way to avert such crisis [in future] is to “address the root cause which is that you [finance ministry] have an unsustainable gap between your inflows and outflows”. No matter how many debts you obtain, at some point in time, it will have to be crisis management,” he said while referring to finance ministry, adding that the commercial lending would evaporate in the air and government would no longer be creditworthy and it would have to move to the IMF, which would dictate Pakistan’s policies as a result. Replying to a query till what time Pakistan can drag the situation, Asad Umar said that at some point in time Pakistan would finally move towards the IMF, but there is no immediate threat of default. “The government would be doing a disservice to Pakistan by not taking corrective measures. If they keep delaying the decision, the caretakers or next government would be forced to go for a bailout,” he concluded. However, Saad Hashmi, head of research Topline Securities said, “We should rely on the reserves figure of $13.941.6 billion, which is definitely enough to cover three months’ import bill, as monthly import bill has been $ 3.8 billion to Rs 3.9 billion during the past few months.” Nevertheless, he added the government needed to go for a further foreign loan in near future, keeping in view the ballooning current account deficits. Despite the difficult situation of the economy, he said, the present debt to the GDP ratio is not worrisome. According to former finance minister Hafeez Pasha’s recent article, the country is entering a period of great financial difficulties. During the four years of the current government, the total cumulative overall gross external borrowing is an unprecedented $42.6 billion, including $6.2 billion from the Extended Fund Facility of the IMF. Repayment of this loan has commenced in 2017-18. Net of debt repayment, the total net external borrowing by the incumbent government is $22.2 billion. During the first three years, it was used primarily to build foreign exchange reserves. External loans have been used totally to finance the current account deficit in 2016-17. In the absence of this borrowing, reserves would have fallen more precipitously as compared to the actual decline of $2 billion. Reserves had started declining from October 2016 onwards. They were rapidly falling to a level below that required to provide import cover of at least three months. The ultimate litmus test of the sustainability of external debt is if the repayment of the outstanding debt can be financed without drawing on the foreign exchange reserves. In addition to that, official data of the Finance Ministry show that country’s total liquid foreign exchange reserves witnessed a reduction of $3.95 billion from the peak level of $24 billion at end October 2016 to $20.05 billion by October 13, 2017. The State Bank of Pakistan’s (SBP) reserves are at $14 billion, sufficient to cover about 3 months of imports. However, the decline in the country’s FX reserves is primarily attributed to widening current account deficit. It was further noted that the current account deficit widened to $12.4 billion during FY17 as compared to $4.9 billion in FY16. The trade deficit is one of the main reasons for such an increase in the deficit, owing to increase in imports of machinery, industrial raw material and petroleum products. This sharp increase is due to increased investments under China-Pakistan Economic Corridor (CPEC) in energy and infrastructure sectors. As imports increased, exports faced a stagnant trend due to the subdued demand, depressed commodity prices globally coupled with the energy shortages, political instability and law and order situation in the country. There was also stagnancy in remittances due to tight budgetary conditions in GCC countries as a result of low oil prices, strict regulatory requirements in the US and depreciation of pound sterling against the US dollar. Nevertheless, the government has managed to put a lid on the negative trend in exports, as exports have increased by 12.2 per cent and workers’ remittances by 1.0 per cent during July-September, 2017 as compared to same period of the last year. Foreign Direct Investment (FDI), during the same period, stood at $663 million, showing an increase of 57 per cent over the corresponding period of last year. With these positive trends strengthening, in coming months the current account deficit will substantially improve in FY18. Pakistan’s Finance Minister Ishaq Dar has not returned to the country Saturday after completing his tour to Dushanbe, Tajikistan to attend 16th Central Asia Regional Economic Cooperation (CAREC) Ministerial Meeting. The PML-N minister, who is facing embezzlement and money laundering charges, had flown to the Central Asian state aboard a special plane from Islamabad with three other people. However, the plane returned Saturday without Dar. Later in the day, a picture of Mr. Dar performing Umrah emerged on social media, sparking speculations that he (Dar) has joined ex-PM Nawaz Sharif in Saudi Arabia and is not intended to make an immediate return fearing arrest. An accountability court has indicted Dar in a corruption reference filed against him by the National Accountability Bureau. According to the reference, Dar possesses assets beyond his declared sources of income. WASHINGTON: The White House retains a list of 20 terrorist groups that the Trump administration claims are operating in Pakistan and Afghanistan and is believed to have shared this list with Pakistani officials, diplomatic sources told Dawn. The sources, however, rejected the suggestion as incorrect that US Secretary of State Rex Tillerson gave a list of 75 terrorists to Pakistani officials when he visited Islamabad last week. Mr Tillerson told the US Senate Foreign Relations Committee on Monday that Pakistan was willing to target terrorists if provided specific information about their whereabouts and Washington plans to give Islamabad the opportunity to do so. Addressing another briefing, Mr Tillerson said the US and Pakistan had been engaged in “a very healthy exchange of information on terrorists” since his visit to Islamabad last week, which aimed at re-enforcing US President Donald Trump’s message to Pakistan to take action against the Taliban and the Haqqani network. He said the information that the US delegation gave Pakistan went “beyond just names of individuals” and also expected “to receive information” from Pakistan that would be useful in targeting militants”. The White House list, released on The Washington Post’s demand, includes three types of militants groups: those who launch attacks into Afghanistan, those who attack targets inside Pakistan and those who are focused on Kashmir. Top on the list is the Haqqani network which, the United States claims, has safe havens in Fata and uses them to launch attacks into Afghanistan. Pakistan strongly rejects the charge, saying that there are no such safe havens inside the country. Harakatul Mujahideen is a Pakistan-based militant group operating primarily in Kashmir. The US says that group had links to Osama bin Laden and Al Qaeda as well. Jaish-e-Mohammed operates mainly in Kashmir and the liberation of the Indian occupied Kashmir is its declared objective. Jundullah is associated with the Tehreek-i-Taliban Pakistan (TTP) and was commanded by militant Hakimullah Mehsud, the Emir of TTP until his death in November 2013. It had vowed allegiance to the militant Islamic State group. The United States identified Lashkar-e-Taiba as one of the largest and most active terrorist organisations in South Asia. Founded in 1987 by Hafiz Saeed, Abdullah Azzam and Zafar Iqbal in Afghanistan, the group had its headquarters in Muridke. It too is focused on Kashmir. Lashkar-e-Taiba was involved in the 2001 Indian parliament attack and the 2008 Mumbai attacks. Lashkar-i-Jhanghvi, an offshoot of anti-Shia sectarian group Sipah-i-Sahaba Pakistan, was founded by former SSP activists Riaz Basra, Malik Ishaq, Akram Lahori and Ghulam Rasool Shah. The US blames this group for committing hundreds of target killings and dozens of mass attacks inside Pakistan. Tehreek-i-Taliban Pakistan, an umbrella organisation of various militant groups, was based in Fata, but has now relocated to Afghanistan. The US says that the group wants to enforce its own interpretation of Sharia and plans to unite against Nato-led forces in Afghanistan. It has conducted hundreds of terrorist attacks inside Pakistan. Other groups on the list are: Harakatul Jihadi-i-Islami, Jamaatul Ahrar, Jamaatud Dawa al-Quran and Tariq Gidar Group, which is one of 13 TTP affiliates. The Tariq Gidar Group has been behind some of the deadliest attacks inside Pakistan, including the Dec 16, 2014, massacre at the Army Public School in Peshawar that left 132 schoolchildren and nine staffers dead. Islamic Revolutionary Guard Corps, Commander Nazir Group, Indian Mujahideen, Islamic Jihad Union, Islamic Movement of Uzbekistan ISIS-Khorasan, Al Qaeda in the Indian Sub-Continent and the Turkistan Islamic Party Movement are also on the list. New Delhi: The primary task of an intelligence agency is to collect and analyze information to safeguard nation's security interests. 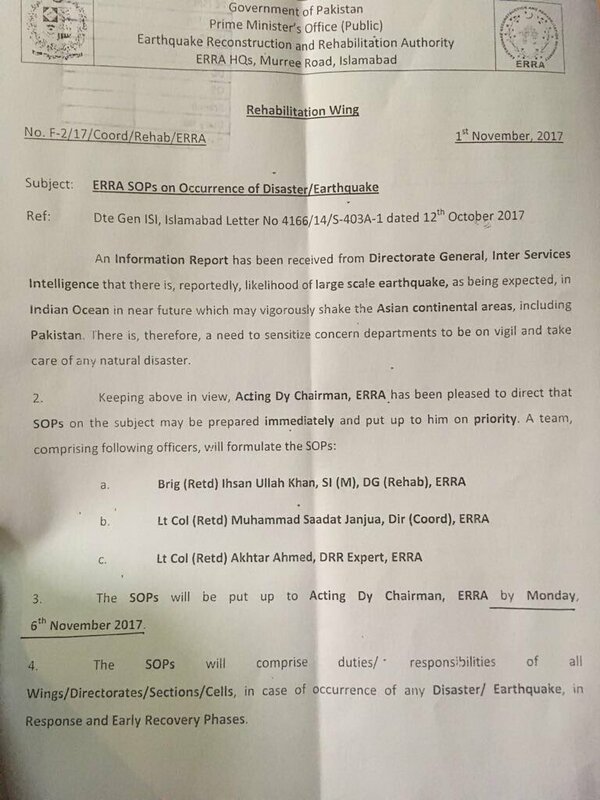 According to a an alleged government circular, it appears, Pakistan's intelligence agency, Inter-Services Intelligence (ISI), seems to have been assigned with an additional task of monitoring earthquakes as well. A document of rehabilitation wing of Pakistan's Earthquake Reconstruction and Rehabilitation Authority (ERRA) have quoted an "Information Report" from Director General, ISI, predicting the liklehood of a possible high intensity earthquake in the Asian continental region. The report was posted on Twitter by the former Pakistan ambassador to the US, Husain Haqqani. THIS is one of my worst nightmares, and it is getting perilously close. Now that the young prince of Saudi Arabia has decided to settle all family business, to borrow a phrase, and his government has formally accused Iran of an “act of war”against his kingdom on account of the missile fired from Yemen intercepted above Riyadh, the tensions that were bubbling beneath the surface are now boiling up. Start with the fact that Pakistan has a history of getting sucked into other people’s wars, usually in return for a pittance of help with our chronic balance of payments deficit. At the moment though, Pakistan has managed to walk the fine line and stay out of the conflicts growing in the Middle East, and the latest visit of the current army chief to Tehran appears to be cementing the country’s neutrality in the whole affair. But the forces pushing and pulling Pakistan into the regional conflicts there are powerful, and should be carefully considered. Ever since Pakistan accepted that ‘gift’ of $1.5 billion from “a friendly country that does not want to be named”, but was later identified as Saudi Arabia, there has been a lurking danger that we are being courted to join the multi-front conflicts that are sweeping across the Middle East. The obvious question that was raised when we learned of this ‘gift’ was: what is the quid pro quo? What are we expected to give in return? There were grounds to be incredulous when we were told that nothing was expected in return. That is not how things work in this world, and surely the bill will become due at some point. The second point on the timeline was the visit to Pakistan by the then crown prince of the kingdom, the father of the young prince today, in early 2014. Our government’s dealings with the kingdom are always shrouded in mystery, but the joint communiqué issued at the end of that meeting carried murmurs of something deeper. Where the last communiqué issued after the visit by a royal carried largely bland language about Saudi support for Kashmir, the mutual support by both countries for Palestine, and “solidarity in the service of their respective peoples and the entire Muslim ummah”, the communiqué of 2014 mentioned “promotion of the causes of the Muslim ummah” with two whole paragraphs on Syria. The forces pushing and pulling Pakistan into regional conflict are powerful, and should be carefully considered. Pakistan was already feeling the tug in the fray opening up in the Middle East in 2014, it appears. The next point on the timeline was the creation of the military alliance, led by the kingdom. Pakistan learned from the news conference announcing the creation of the alliance that it was a member. That raised another important question: have we secretly agreed to deploy ground troops in Yemen? The answer was no, going by strenuous government denials in the wake of that news conference, not yet, but the pressure was on. Then came the hectic diplomacy, with Nawaz Sharif and then army chief Raheel Sharif taking turns to visit the kingdom, with no attendant announcement on the substance of the conversations held there. A commitment was issued that Pakistan will defend the two holy mosques, but nothing further. The next point on the timeline was the announcement that former army chief, Raheel Sharif, will be heading the alliance and will be based in Saudi Arabia. Some politics revolved around that issue, but the appointment was finally approved. Then the king died in 2015 and the crown prince was elevated to the throne. His successor to the crown prince was Mohammad bin Nayef, who was suddenly relieved of his charge in June of this year and replaced with the son of the king, the present young prince Mohammad bin Salman. And then comes the night of the long knives, Nov 4, when Lebanese prime minister Saad Hariri landed in the kingdom and announces his resignation, a large section of the royal family is rounded up on charges of corruption and placed under arrest, and Riyadh comes under attack from long-range missiles fired from Yemen, that it later alleges were supplied by Iran and constituted an “act of war”. Things are heating up to boiling point now. The royal family is in a tumult, war drums between Saudi Arabia and Iran are sounding, and Lebanon appears to be moving towards becoming the next Syria. Meanwhile, Pakistan’s former army chief still sits as the commander of the alliance, while media reports say Pakistan has signed three separate short-term loan agreements worth $700 million from the Islamic Development Bank, in which Saudi Arabia holds the largest shareholding of 23.5 per cent shares (the second largest shareholder is Libya, with 9.43pc). Of that, according to the same reports, almost half has already been availed of for oil imports, also from the kingdom. 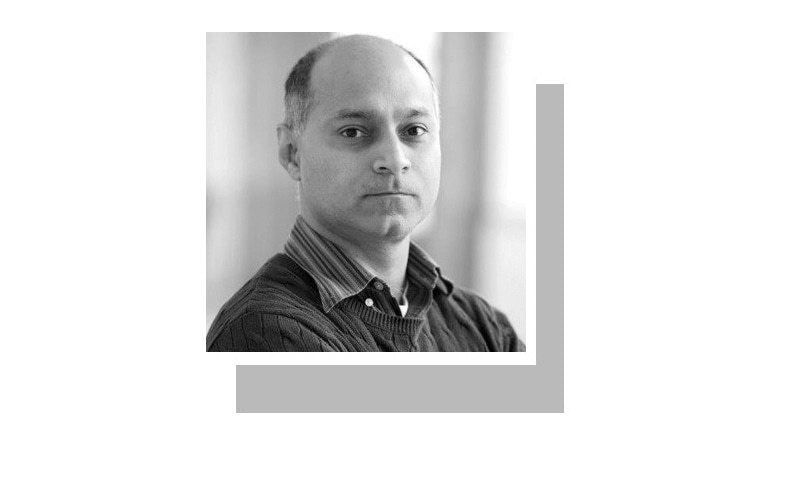 It is a pattern for Pakistan now that every government leaves the treasury dry, and every incoming government reaches out to its friends abroad for a bailout. The PPP government famously asked for a $100bn Marshall Plan-style bailout from the Americans in 2008, and the Nawaz Sharif government asked for a bailout of up to $4bn from the Saudis. The former got an IMF loan of $7bn instead, while the latter got a ‘gift’ of $1.5bn. Now we are once again moving towards a repeat of that cycle, except Trump is sitting in D.C. and the kingdom has issues of its own. Both are eyeing Pakistan’s army, and have some demands of it. The Chinese have no history of bailing anyone out, with the closest example being the Sri Lankans, who had to surrender territory in return for a debt-equity swap on Hambantota Port. The chips are not falling nicely. It is more vital than ever that the hard-fought stability that Pakistan has acquired in the past few years not be bargained away in return for a bailout since we are moving towards a depletion of the foreign exchange reserves one more time. Staying out of the regional conflicts that are breaking out to our west ought to be foreign policy priority number one for us. The push-and-pull factors dragging us into that quagmire are powerful, but it is difficult to overstate the importance of transcending them this time round. India foresees an economic & pol chaos in Pak by April 2018. Thats when they plan to launch their terrorist assets & roll into Pak. PMLN Govt orders all Pakistani citizens to disarm & handover their automatic weapons by January 15th. Now you connect the dots!